Chanichai Hayishivos is a small synagogue run in what used to be an apartment in the Moer Chaim neighborhood of Safed. 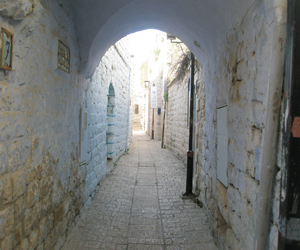 It was the first Ashkenazi minyan in that neighborhood of Safed, and now there are about five others elsewhere in the city. However, this is the minyan to know about who are looking to pray from an Ashkenazi prayer book. The synagogue was founded by a group of Israelis mixed with some English speaking immigrants who wanted a traditional Litvak (Lithuanian) yeshiva style service. It is very popular in the summer with the many visitors who come to Safed for their vacation. These Litvak kollel and yeshiva families stay in the religious Moer Chaim neighborhood at the bottom of the city and it is very convenient for them to pray there. The synagogue is run as a Beit Midrash during the week where all are welcome to come and study and there are only regular services on Shabbat and Festivals. With room for between 40 and 45 men, there are about 25-30 regulars during the year. Of course, during the summer vacation the numbers swell and it can occasionally get crowded. The ladies section holds up to 15-20 women with a wooden mechitza as well as a curtain. Normally only about 4 women attend for Shabbat morning services, although in the summer and on Festivals more women do go. Women don't usually attend the Friday night services. The synagogue has one Sefer Torah and is in the process of having another one written. As the synagogue community doesn't use electricity from the grid on Shabbat for fear of other Jews desecrating Shabbat, all the electricity used comes from batteries. This means that the lights can occasionally flicker and the gabbai (shul warden) has to be careful not to overload the battery. However, they are able to run a fan in summer and a gas heater in winter. Services are only on Shabbat and Festivals. The prayer book is Litvak Ashkenazi and there is a traditional Yeshiva style of dovening (prayer) which attracts the mostly Israeli 'black hat' crowd. It gets very busy in summer when people are looking for this type of minyan. The gabbai speaks both English and Hebrew so you can feel welcome. Don't forget to check out the rest of our site for more information about Safed.